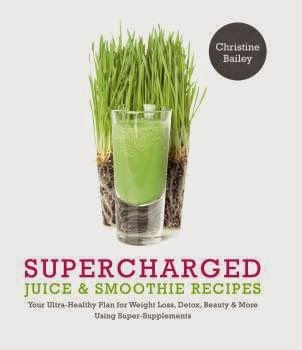 Whether you want to lose a few pounds, detox, or just add more produce into your diet, Christine Bailey’s Supercharged Juice & Smoothie Recipes is a good resource. I am a juice and smoothie addict. From the first time I tried a fresh pressed vegetable and fruit juice, I’ve been hooked. I toss a mix of fruit, veggies, and greens into my high-speed blender several days a week and ensure I get in my minimum of five servings of produce a day. Many studies tout the health benefits of adding plants to one’s diet, but what if you could boost those benefits even more? Adding superfoods to the mix might do the trick. Nutritionist Christine Bailey’s new book shows you how. Whether you want to lose a few pounds, detox, or just add more produce into your diet, Supercharged Juice & Smoothie Recipes is the go-to guide for a healthier 2015. Christine Bailey has over 18 years of experience in the food and nutrition industry. Her book The Juice Diet explains how and why juicing helps juicers lose weight. Supercharged Juice & Smoothie Recipes explains how boosters such as teas, powdered supplements, herbs, and specialty foods increase the power of smoothies and juices for optimal nutrition. I received an advance copy to review and am pleased with the information, recipes, and how I feel. Bailey starts the book with a short discussion on how to supercharge one’s life with juicing, smoothies, and superfoods. She keeps it simple and easy to understand, even when describing the superfoods used in her recipes. Bailey includes gluten-, nut-, dairy-, seed-, soy, and citrus-free recipes in the mix, so this guide is suitable for everyone, including vegans. The recipes include fruit-based juices (page 25), vegetable-based juices (page 53), creamy smoothies (page 117), and ultimate smoothies (page 83) that include my favorites Green Machine (page 89) and Magnesium Lift (page 94). I’m not a medical professional and am not sharing medical advice. These are my results and not meant to take the place of a medical consultation. Bailey includes recipes that help with boost energy, immunity, and anti-aging benefits. I’m on the hunt for natural remedies for joint pain and inflammation, so I focused on those recipes for this review. Moringa, sea vegetables, green tea, chia and flax seeds, turmeric, and Matcha are already on hand, so it made it easier to jump right in. I did feel energy boosts from recipes I tried and know there was a difference in pain level when anti-inflammatory blends took a starring role on my menu. I’m considering taking on Bailey’s Supercharged Detox Blitz Weekend (page 23), but know I need to clean up my entire menu before I take on an intensive weekend. 2014 was a good year and 2015 will be an even healthier one with better eating and Supercharged Juice & Smoothie Recipes on my side. Pick up your copy starting January 1, 2015 for $14.95 from a bookstore near you. Let me know what your favorite recipes are. Here’s to your health! Yes, I am raising my glass of Cranberry Burst (page 33) to you. Disclosure: Sherrie Thompson received a complimentary copy of this book for her review. No monetary compensation was received. Sherrie's thoughts, opinions and ideas are 100% her own words and have not been influenced by the sponsor. This sounds like an excellent book for me and my husband. I needling have more vegetables in,yo diet and smoothies would help me achieve that goal. I also,like the idea of,the anti-inflammatory benefits .